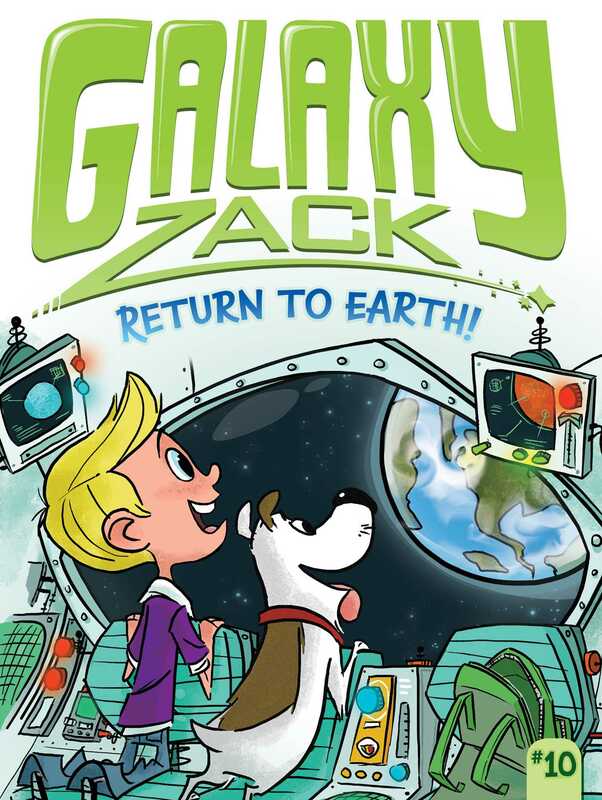 Zack is a planet-hopping pro—but a return to Earth results in some unexpected puppy trouble in the tenth Galaxy Zack chapter book adventure. Zack is headed back to Earth for the first time since moving to Nebulon. He can’t wait to see his best friend Bert and show his new friend, the former bully Seth Stevens, all around his old stomping grounds! Luna’s excited too. A little too excited. When the pooch escapes and goes missing, sightseeing plans take an unexpected turn. Will Zack find Luna before he has to head home to Nebulon? Zack Nelson sat at the kitchen table. He was in his house on the planet Nebulon. His dog, Luna, curled up on the floor beside him. A holographic, 3-D image of stars in space floated above the table. “This planet-collector that dad just brought home from Nebulonics is so grape!” said Zack. He ran his finger along the screen of a small handheld device. Luna tilted her head and yawned. Then she scratched her ear with her back paw. The 3-D image of a small blue planet appeared among the stars. Using his finger, Zack moved the floating planet to a far corner of the star field. Then he tapped on the device again. A planet covered with orange specks appeared. “Arrrrr,” moaned Luna, stretching her front legs. Zack added a few more planets he had visited since he and his family moved from Earth to Nebulon. The door to the kitchen elevator slid open. In walked Otto Nelson, Zack’s dad. He was home from his job at Nebulonics. “Hey, Captain, that looks great!” said Dad. He looked up at the planets orbiting above the kitchen table. Luna jumped up and ran over to greet him. “Those are all the planets I’ve been to,” Zack said proudly. When Zack had first arrived on Nebulon, he and Seth got off to a rough start. Although Seth could still be a bit tough to get along with sometimes, the two had since become friends. “So, it’s a planet I’ve been to?” Zack asked. “Juno? Plexus? Gluco?” guessed Zack. He looked up at all the holographic planets floating above the table. Book Cover Image (jpg): Return to Earth!